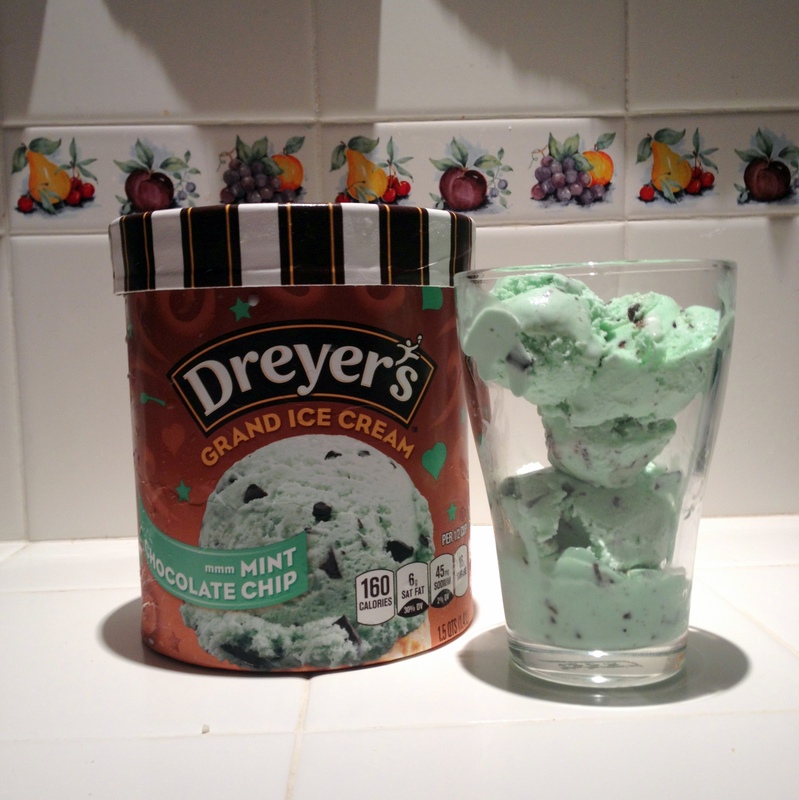 You guys, my love for mint chocolate chip ice cream knows no bounds. There is something about the combination of minty freshness and decadent chocolatey-ness that really makes my heart sing. I’m no respecter of brands – nearly anything chocolatey and minty [green coloring not required] gets my heartstrings hummin’ along – but I definitely have my preferences. Hence, I embarked on The Quest For The Most Delicious Mint Chocolate Chip Ice Cream…which shall hereby be known as TQFTMDMCCIC. It’s pronounced “t’qwuf t’mmm-duh-mmm-kick”…it’s got a little bit of a rhythm to it and sounds like beatboxing. Sort of. Almost. You may do a little dance whilst saying it if you wish. But what good is TQFTMDMCCIC if I don’t share the deliciousness in photographic form and opine on each and every iced cream I try along the way?! THE DISH: A creamy smooth, green mint ice cream with a nice zingy flavor. Packed with semi-sweet chocolate chunks of varying rectangular size. PROS: I do like the mint flavor on it’s own! It’s not timid. Very refreshing. The chocolate chunks take a little longer to melt, so each bite has a smooth chocolatey finish that’s kind of nice. Also, the chunks vary greatly in size, which makes for a fun eating experience! CONS: Personally, I don’t like ice cream that I have to “chew”, if that makes sense. And these chocolate chunks require quite a bit of jaw action. Also, the chip-to-cream ratio seems okay at first, but occasionally I end up with a mouthful of chips alone, which is also not my fave but if that’s what you’re into you’d dig it. The mint by itself is punchy, but still is overtaken by the chocolate chunks, and I don’t love the chocolate by itself enough to really love that. OVERALL RATING: 3 out of 5 stars. It ain’t bad, it’s good quality, and I do enjoy it…it just ain’t worth my money unless it’s on sale (which it was at the time this was purchased). 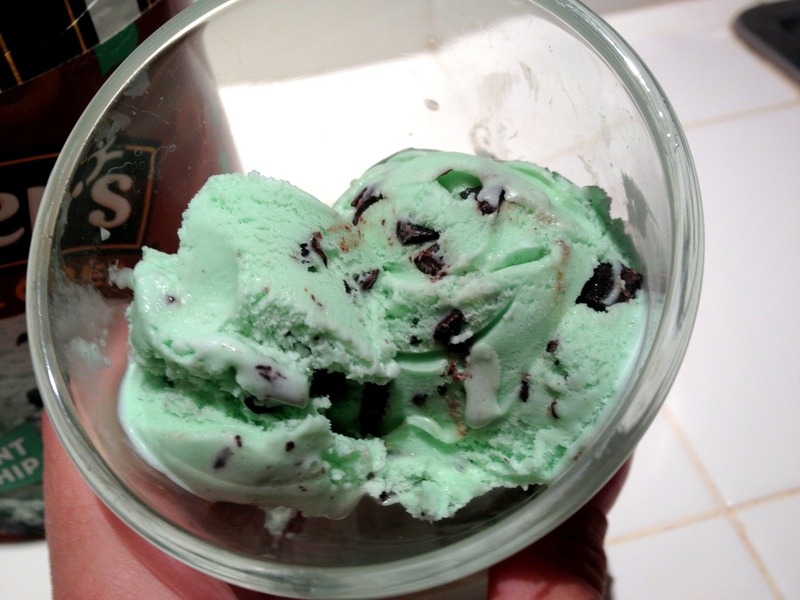 I typically enjoy the off-brand/store brand mint chip just a smidge more! I hope you’re all excited to join me in TQFTMDMCCIC! What’s your personal favorite flavor of ice cream? Any other mint chip lovers out there with recommendations for me?? 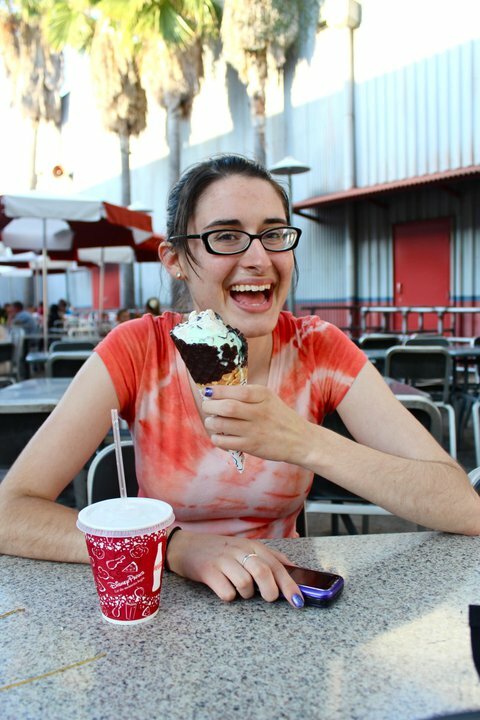 PS, mad props to my seester Sarah, who documents nearly all of the moments in my life that are worth documenting [AKA that ice cream cone at Dinneyland]. She has some sweet skillz. PPS, in the interest of full disclosure, I ain’t sponsored by nobody and don’t have aspirations to be. This blog is just for fun, nobody is paying me to do it, and the thoughts/opinions/words are all my own. I initially purchased this ice cream to go along with my birthday cake last month (more on that later).